Pot Limit Omaha (or PLO) is the second most popular form of poker. While the game shares many similarities with Texas Hold'em (and if you're just starting out your poker journey you should familiarize yourself with the rules of PLO's more popular older brother) there are a few key differences between the two, that we're going to outline in this article. "PLO is the ultimate game for players who like fast action and big pots." - Luke Schwartz, HighStakes Pro. The first and most apparent difference that separates PLO from Texas Hold'em is the fact that after the blinds are paid, each player receives four instead of two hole cards. This makes Omaha considerably more complicated, increasing the number of possible starting hands from just 169 to more than 16,000. This increase in complexity also affects the average strength of poker hands that players are able to construct using community cards. Flushes, Straights, and Full Houses are a much more common occurrence in PLO than they are in Hold'em - which makes the game arguably a lot more exciting to play. The second major difference is the fact that while Hold'em is most commonly played in the No-Limit betting structure, that doesn't impose any limitations on a number of chips players are able to bet at any given moment in the hand, in Pot Limit Omaha, maximum betsizing is going to be dependent on the size of the pot (more on that later). The last difference between PLO and Hold'em is the way players construct their five card poker hands using hole cards and community cards. 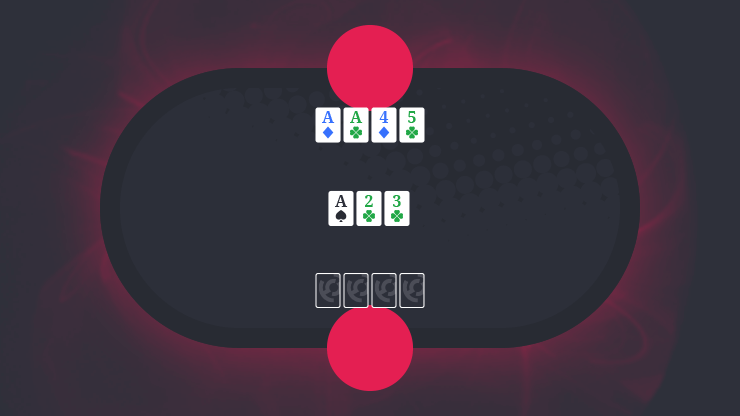 In Hold'em, players are allowed to use any number of their hole cards while in PLO players are forced to use exactly two cards from the four hole cards that they're dealt at the beginning of the hand. Let's compare a Hold'em starting hand of A K with a somewhat similar PLO hand A K 5 2 on a Q T 8 7 3 board. While the Hold'em player is holding an Ace-high spade flush on this board using just an A from his hand ( A Q T 8 3 ) PLO player is forced to use two cards from his starting hand and therefore can't build a flush even though there are four cards of the same color among the community cards. PLO player only has an Ace-high hand with no flush ( A K Q T 8 ). Given how the difference described above is often a bane of beginner Pot Limit Omaha players, let's further illustrate this point with another example. The board comes Q J 8 5 2 . In this scenario, Player 1 doesn't have a flush because he or she can't use all of the hole cards, using exactly two of the hole cards Player 1 is only able to construct an Ace-high hand - A K Q J 8 . Player 2 doesn't have four-of-a-kind deuces, his or her hand is three-of-a-kind deuces with Queen and Jack kickers - 2 2 2 Q J . Player 3 is the winner with a Jack-high flush - J T 9 5 2 . 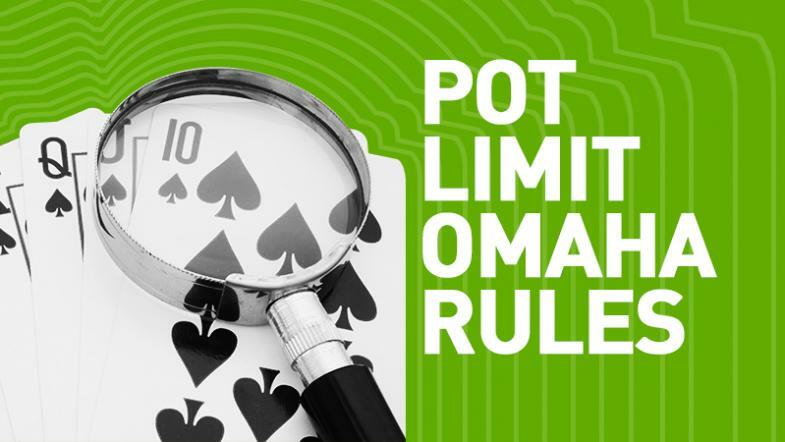 Like we've already mentioned before, Omaha is usually played using the Pot-Limit betting structure, which basically means that the maximum amount players are allowed to bet is connected to the number of chips that are currently in the pot. The formula for calculating the pot size bet is relatively simple, and while the online poker client will make all the necessary calculations for you, it's best to know the fundamental rules that govern the game. In order to calculate the maximum bet size in a Pot-Limit game you have to add the size of the pot at the start of the hand, plus the bet, plus your call. You're allowed to bet that amount in addition to your call. If that sounds confusing to you, let's clear it up with a few easy examples. You're playing in a PLO game with $0.05 small blind and the $0.1 big blind. You're first to act on the button and everyone folded before you. The pot size is equal to $0.05 small blind + $0.1 big blind = $0.15 your call would be equal to the size of the big blind which is $0.1. You're allowed to bet $0.25 ($0.15 pot + $0.1 call) on top of the call amount ($0.1) which makes it $0.35 total. In a second example, you're heads-up on the flop with your opponent betting $0.5 into a $1 pot. Pot size bet in this situation would be equal to $1 + $0.5 + $0.5 = $2. You're allowed to bet $2 in addition to your call which would make the pot size bet equal to $2.5. There's also an easier way of calculating the pot size bet. You just have to multiply the last bet made in the hand by three and add any other amount currently in the pot. In the example described above 3 x $0.5 = $1.5 and then add the initial size of the pot, $1.5 + $1 = $2.5.